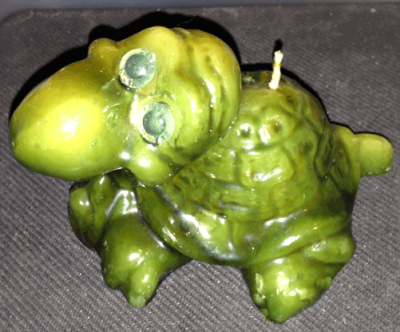 This green tortoise candle is over 30 years old and in pretty rough shape. 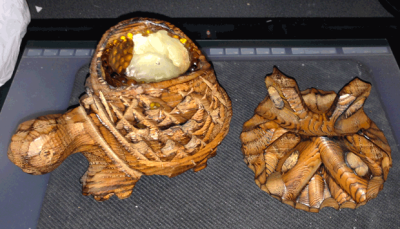 There is a glossy glaze that covers the surface of the candle, and it looks as if it has melted and reset in places - perhaps the box it was in got very warm at some point. This surface gloss is knicked and chipped all over the piece. 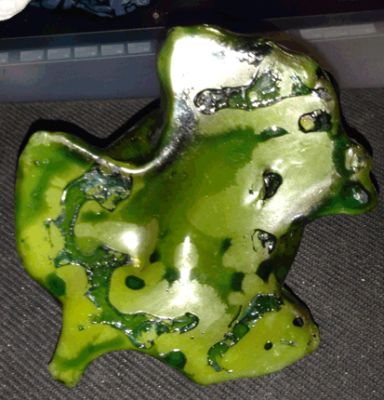 The underlying wax is a grass green, and the shading on the piece appears to be due to the glossy overlay. 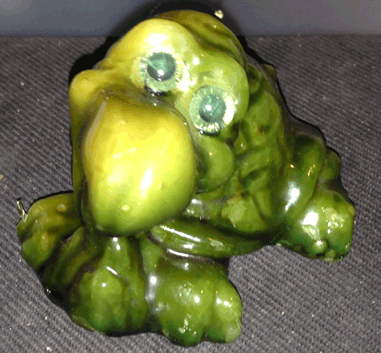 The eyes are plastic; they are glued on, and give the piece an endearing quality. It's a very cute little turtle and appears to be looking up in adoration. The candle has never been lit. The turtle is about 45 inches long, 4 inches wide and just under 3.5 inches tall. It weighs 8.5 oz. Despite all it's flaws, it's an endearing little piece of nostalgia. 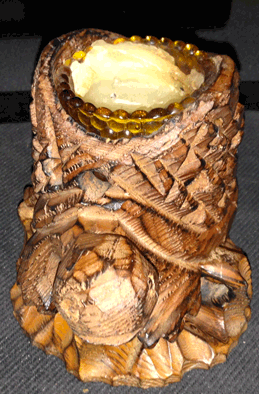 This is a hand carved wooden candle holder that comes with 3 pieces. 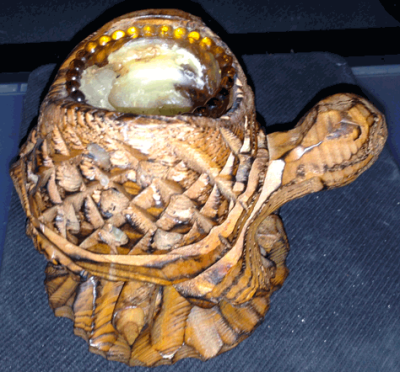 It has a wooden base, the wooden turtle, and a yellow glass candle holder. This piece has been well used and appears to have been a favorite in the collection. There are no stickers or maker's marks on this piece. 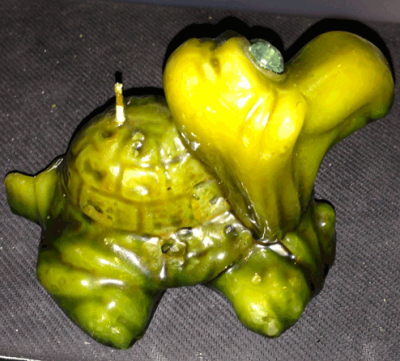 The yellow glass candle holder is inserted into the shell of the tortoise, and will not come out, which makes me wonder how they got it in there. 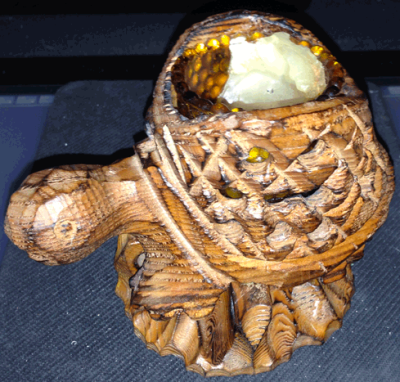 There is some wax drippage and the wax in the holder needs to be removed and replaced. The wooden pieces are in good condition and no parts are broken. 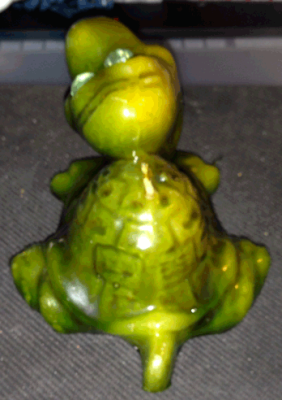 Set up as one piece, it is 5.5 inches long fron head to tail, 4 inches wide, and 4 inches tall. It weighs 1 lb, 0.6 oz. 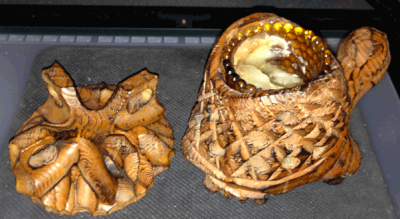 There is a natural glossiness to the piece and the grain of the wood really stands out. It was obviously a favorite in the collection. 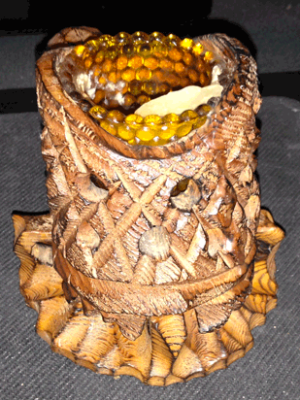 This candle holder is over 30 years old.